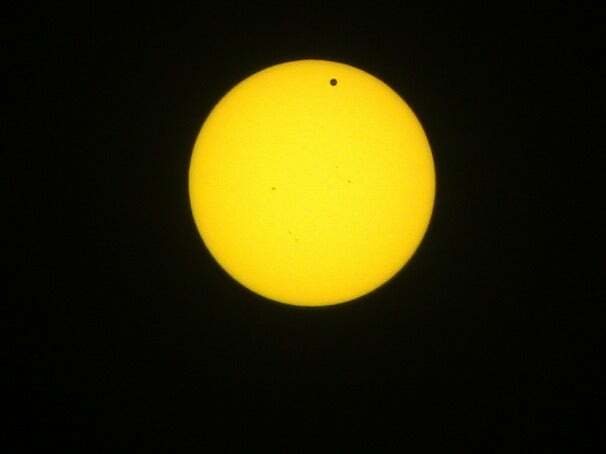 Did you miss the transit of Venus in front of the sun yesterday? Were there clouds in your skies? Stuck in Antarctica? If you didn’t catch this last alignment of our cloud-shrouded planetary neighbor and our closest star until 2117, here are some ways to re-live the transit. My favorite video was taken by NASA’s Solar Dynamics Observatory, a spacecraft dedicated to observing the sun. You can watch Venus passing in front of the sun and its giant coronal loops, where plasma moves along the sun’s magnetic field lines. While Venus appears to be quite close to the sun, the second planet is about 0.72 times as far from the sun as Earth is, about 67 million miles from the sun compared to Earth’s 93 million miles from the sun. The Exploratorium, a science museum in San Francisco, had a webcast of the transit broadcast live from the summit of Mauna Kea, an astronomical observatory in Hawaii. The following video shows Venus just starting to cross the sun, passing in front of our star, then finally leaving the face of our sun for the next 105 years. Check out the Exploratorium's site for some highlights of the transit. Some of your friends may also have photos of the transit. I spent the afternoon in California telling high school students about the physics behind transits and setting up solar-filtered telescopes. Eliya Selhub was with us and took these great photos of the transit through a variety of telescopes and cameras. Did you see the transit and have photos you want to share? Link to them in the comments! Alessondra Springmann is a freelance writer and astrophysicist. Follow her @springingly.